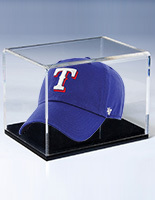 Model display cases crafted from durable injection-molded polystyrene for years of use! Black MDF base coordinates with any décor! Case without extrusions keeps the spotlight on a model display! Foam feet prevent scratching surfaces! 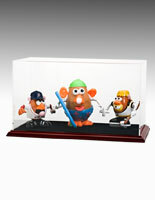 These plastic model display cases provide a safe place to both store and showcase prized collectibles! The economically-priced holders are the perfect choice for home collectors, in addition to some retail environments. 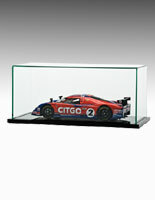 Model display cases that have a clear plastic top, also known as scale train or car displays, allow a collector or enthusiast to highlight their favorite pieces, rather than keeping them packed away in a box or other packaging. These units are excellent for a wide variety of other items, including figurines, coins, sports memorabilia, weapons and more! 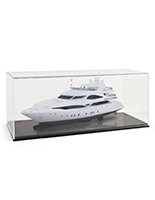 These diecast car, scale ship or train holders, non-locking model display cases are an affordable choice for custom displaying. They are crafted from relatively cheap, but very strong plastic, offering an inexpensive and safe alternative to glass showcases. 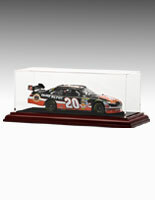 The model display cases that are great for the collection enthusiast are still clear (though the plastic may have a very slight bluish haze), and do not have any extrusions, to offer an unobstructed view of displayed collectibles. The base is constructed from MDF, or medium-density fiberboard, with a black coating. This simple and non-ornate showcase is designed to highlight the displayed items, rather than take away from their beauty. Small foam feet are found on the underside of the base, preventing scratches on the surface upon which the showcase is placed. The main showcasing area is accessed by simply lifting off the plastic top. There is no locking mechanism or feature to this holder, so it is not recommended for use in high-end or public areas, such as museums. 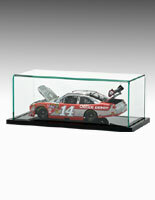 14.5" x 6.0" x 7.0"
12.5" x 5.0" x 5.0"
Just what is needed to display my husbands diecast in the LIVINGROOM!! They look good enough to display in there! I even had custom shelves to hold them! Thank you for your feedback, Debra!